Sometimes life can get so busy that we miss out on important interactions with our family. Days move fast and nights fall short, often leaving a sense of asking where did the time go. Children grow up in our presence and we yearn for time lost when we realize that they are older and want more independence. Reality kicks in because you wonder how well do you know your child, their needs, their wants, and their desires. You think about the relationship or the lack of connection when they don’t show excitement to spend time with you like they do with their peer groups. Studies show that parent- child bonding starts at birth. 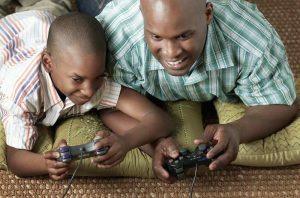 How you interact, speak, and play with your kids are critical developmental factors for healthy bonding. As a mental health practitioner, I often ask parents when and how long they play with their kids. This question is not easy for parents to answer. It involves self-examination, reality checks and immediate plans of action. Think about it. We often say, enjoy being a kid while you can? Well, why not enjoy being a kid with your kid when you can? The interaction is unforgettable. The time spent together is priceless. And most of all, the relationship with your kid get stronger, closer, and everlasting. There is no such thing as having no time to play with your kids. Just like you plan your work week, meal prep, adult weekend activities, etc., you can plan at least 30 minutes of play time. 2. Play a game or an engaging activity that they like. Remember, it’s about enjoying the experience. If your kid likes to play dressup, then get your garments ready. If your kids like animated adventures with superheroes, then get your gear and costumes (even if you have to improvise). If your kids like outdoor sports, plan accordingly and give it your best shot. Whatever they like, you like. It’s your way of showing how well you know them and have been paying attention. 3. Follow-up with your kids about the experience. There’s nothing like seeing your child express the joy and fun time they have playing with you. This also helps you in planning the next adventure of play. 4. Be consistent. Be intentional. Just play.